National Academy of Sciences, 2101 Constitution Ave., N.W., Upstairs Gallery, Washington, D.C. This exhibition features more than 20 health posters from the 1920s to the 1990s. Covering infectious diseases such as malaria, tuberculosis, AIDS, gonorrhea, and syphilis, the posters come from North America, Europe, Asia, and Africa. These posters provide insight into the interplay between the public's understanding of disease and society's values. They reflect the fears and concerns of the time and also the medical knowledge that was available. Considered an art form, many are beautiful and entertaining, but during their heyday, they sought to educate people on matters of life and death. Public health took a visual turn about 100 years ago. 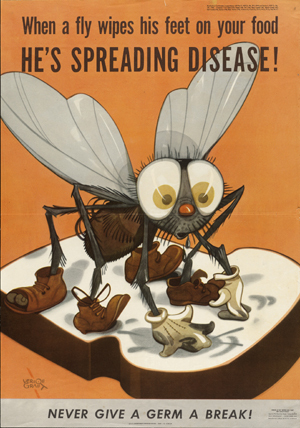 In an era of devastating epidemic and endemic infectious disease, health professionals began to organize coordinated campaigns that sought to mobilize public and government action through eye-catching posters, pamphlets, and motion pictures. Impressed by the images of mass media that increasingly saturated the world around them, health campaigners were inspired to present new figures of contagion, and recycle old ones, using modernist aesthetics, graphic manipulations, humor, dramatic lighting, painterly abstraction, distortions of perspective, and other visual strategies. They devised a new iconography of contagion that emphasized visual legibility and the pleasure of the view. This exhibition was organized in collaboration with the National Library of Medicine of the National Institutes of Health.